Tim Mahurin, like many of us, begins in nature ... often wandering the brook behind the studio, picking up stones, dragging back treasures to the back porch: here a curious piece of liquid wood, there an old marble hitching post carved by long immersion in the roiling Whetstone, where it had been tossed away. Some stones are complete. Others call the artist to reveal in the surface of stone a torso, a face, a seminal fish. 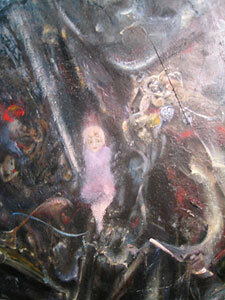 Mahurin's visionary way of working is preceded in history by the Surrealist and Expressionist movements arising shortly after the first World War in an atmosphere of unprecedented collective horror at our destructive power, and an artistic thrust for liberation and transcendence under the looming rise of Fascism in Europe. For the Surrealists and the Expressionists alike, the artistic process unites the unconscious dream world with the conscious natural world to form a "surreality" or, in modern terms, a state of revelation and reflection, essential and free of conceptual programming. The major spokesman of the movement, the poet and critic André Breton, published "The Surrealist Manifesto" in 1924. Drawing heavily on theories adapted from Sigmund Freud, Breton saw the unconscious as the wellspring of the imagination. He defined genius in terms of accessibility to this normally untapped realm, which, he believed, could be attained by poets and painters alike. This core philosophy pervaded creative thought throughout the modern period and into the present, in the Fantastic, Surrealist and Visionary movements in painting. Collector Eric Zuesse, who arguably houses one of the larger collections of Expressionist works in Vermont, comments on Mahurin's work: "Tim's painting 'Cascades' is so stunning that every time I look at it I am yet again shocked by it, and also left wondering how anyone could have done it. How could such modest means produce the most colorful and thunderous multitiered waterfalls pouring over rocks and cliffs into a magical pool at the bottom, curtained there by vertical mists -- and the whole thing be achieved via merely nonrepresentational slashes and slides of white paint? Don't ask me. I've seen this painting every day since purchasing it a year ago, and it still surprises me each time just as much as it did when I first saw the work. This is the least static image I have ever seen, and I've been to many of the world's leading art museums and have always loved art. Like all great artists, Tim doesn't merely communicate nature; he has the capacity to produce images that transcend nature by penetrating to a higher reality." Tim reflects: "One day by the ocean, I came on a stranded tidepool of guppies, swarming in random chaos in the slanting light. And suddenly, for a dazzling moment, they assumed the clear form of a crocodile. Like clouds. Like our self-reflecting mind. This moment of truth, this nature of human consciousness to create form from the formless, is what I am exploring here in these paintings." In 1950 Hans Namuth, a young photographer, wanted to photograph and film Jackson Pollock at work. Pollock promised to start a new painting especially for the photographic session, but when Namuth arrived, Pollock apologized and told him the painting was finished. 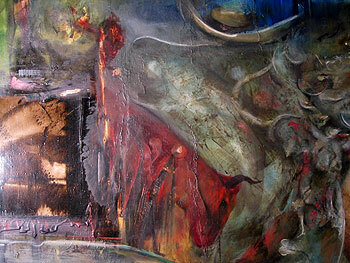 Namuth's comment upon entering the studio: "A dripping wet canvas covered the entire floor.... There was complete silence.... Pollock looked at the painting. 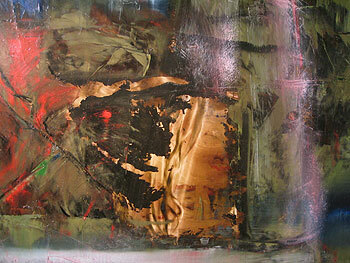 Then, unexpectedly, he picked up can and paint brush and started to move around the canvas. It was as if he suddenly realized the painting was not finished. His movements, slow at first, gradually became faster and more dance-like as he flung black, white, and rust-colored paint onto the canvas. He completely forgot that Lee and I were there; he did not seem to hear the click of the camera shutter.... My photography session lasted as long as he kept painting, perhaps half an hour. In all that time, Pollock did not stop. How could one keep up this level of activity? Finally he said, 'This is it.'" 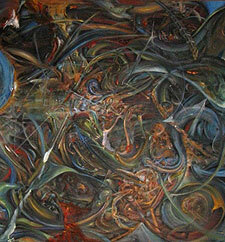 Tim Mahurin's paintings, unlike Pollock's, are often narrative. Complex, convoluted, synchronicities filled with the element of surprise, the imaginings are held to the surface by the discipline of the brush and the minimalist simplicity of one material: liquid paint. His work is often quite large in scale, as if to contain the physicality of what Jackson Pollock called the "going into" the painting, a trance that reveals the not-verbal, not-mental experience of What Is, Now. It is the trancelike state, the seeking after a rarified experience of meditative creation bypassing conceptual thought. The intention is that the viewer shares the experience with the open gaze. 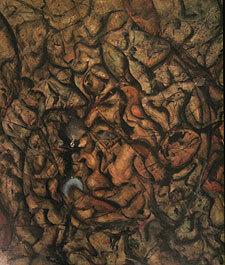 Mahurin's works are almost impossible to simply observe; like a secret door, they call to enter and explore. Gallery in the Woods hosts a one-man show of recent work by Tim Mahurin from July 6 through September 2. A reception for the artist is scheduled on Friday, July 6, from 5:30 to 8:30 pm. The gallery is located at 145 Main St., Brattleboro, telephone: (802) 257-4777. Preview the work online at www.galleryinthewoods.com. Suzanne Corsano, co-owner of Gallery in the Woods, has also worked as a potter and painter. EDITOR'S NOTE: Even the full-color samples from Tim's work seen here cannot substitute for experiencing the work in person. Stop by Gallery in the Woods sometime over the summer for a truly complete exploration of Mahurin's unique worlds.